A being of pure power and destruction is annihilating the East Coast. To stop this menace, Cole must find the key to unlocking his undiscovered powers hidden deep within New Marais. Standing in the way is a power-hungry dictator that will stop at nothing to rid him from the city. Gain enough power to defeat The Beast or witness the destruction of the world. Save the world or destroy it. The Characters - Someone in New Marais holds the secret to your Powers and defeating The Beast. Face new enemies, make new allies, and defend yourself against powerful forces rallying to destroy you. Powers - To protect the city of New Marias and ultimately defeat The Beast, Cole must become more powerful than he’s ever been. Welcome to New Marais - Welcome to a town of history and secrets. Hidden within this town lies the key to Cole’s powers and possibly the salvation of the human race. Scared citizens roam the seedy Red Light district, armed militia patrol the French Quarter and deadly mutated creatures inhabit the sticky swampland. Will you be strong enough to save the city from self-destruction, or will you help it along? inFamous 2 (Platinum) is a great game, with an interesting plot and memorable characters. Sucker Punch did a great game. absolutely amazing game, loved every second of it. wasn't sure they'd be able to top the first one, but they certainly did. used the code for Festival of Blood too, great spin off there. I played the first installment of this series to death, so it was no surprise that I wanted to get my hands on the second one as well. I was definitely not disappointed. 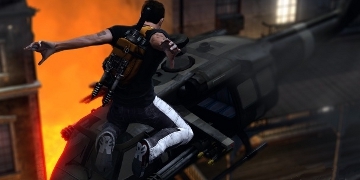 Those who have played the first game will be very happy to once again be put in the fast-paced action of inFamous 2. (Karma system is back and just as awesome!) Hopefully you guys enjoy the game as much as I did. inFamous 2 one of the best games ever. Simple. 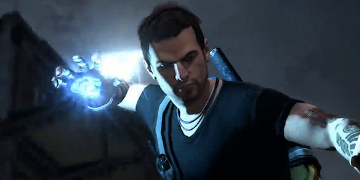 Unsurprisingly Infamous 2 is more of the same, but thankfully in a good way. Unlike many sequels you don't have long to gain similar powers to those in the first, with a few additions and the city area is more compact, which makes for more of a fun sandbox experience. The change in voice actor to the first game is jarring but not important to the gameplay, which is thankfully the main reason for playing with the varied conflicts and exploration on offer. Not a big departure or significant improvement but keeps the elements that worked from the original. When I played this I loved it the first ten minutes. And afterwards it continued to surprise me. The game play was great and I felt as though I was part of it. After the first Infamous, Infamous 2 just blew it out of the water. Here it comes... Infamous 2 is actually really good. Graphics, gameplay and storyline are rocksolid and fun. I love how the parcours climbing and running is implented into the game and a lot of sidemissions and a leveleditor with custom build missions add a lot of play-length. Infamous 2 - a game about mutants and superpowers, but giving you the choice to be good or bad in what is basically a sandbox world. I don't know why but I can't stop choosing bad. It always seems more fun to me... oh well, Infamous 2 is a great game, and a good step up from the first one. Fantastically good game, considerably better than the original, better voice acting, better choices (instead of being faily simplistic good vs evil, you get more realistic and nuanced choices) and also lots of user generated missions which people can share over PSN. Really fun, definitely worth it. Absolutely love this game. This game is so awesome the only negative thing I could say about it is it makes me sad the real life isn't this great,. good storyline, brilliant gameplay, cool characters. Innovative touch with the choice system (allows you to define your character's personality by making particular choices), puts you in control of the storyline.